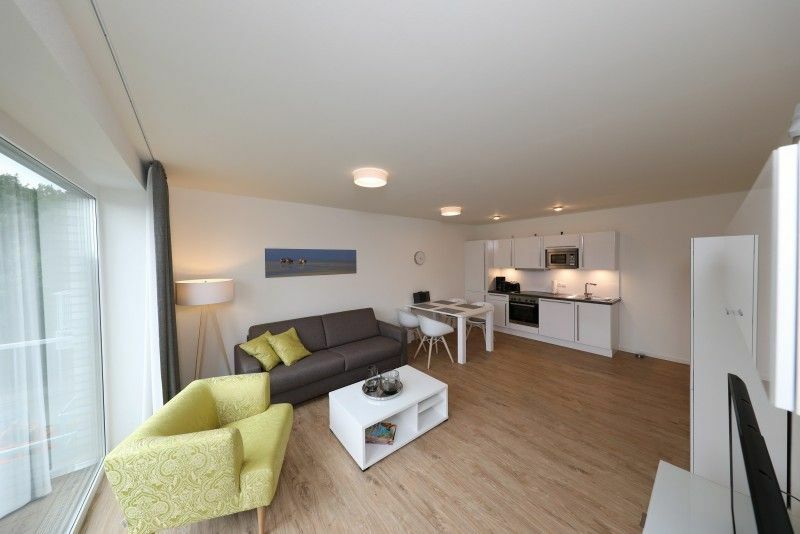 Welcome to our newly built, modern apartment with sauna, apartment-own underground parking and only 400 meters from the beautiful sandy beach in Sahlenburg! To experience unforgettable days, you can set up and feel good on 68 m². The modern and fully equipped kitchen leaves nothing to be desired. From the afternoon, enjoy the sun and the side sea view on our balcony with awning. In the open dining area you can spend cozy evenings with board games or a glass of wine. After a day full of variety, treat yourself to a relaxing break in the apartment sauna. The bedroom scores with a cozy box spring bed (180 x 200 cm) and blackout curtains. Two additional guests can comfortably sleep on the high quality sofa bed in the living room (160 x 200 cm). Again blackout curtains are available. The apartment can be booked for a maximum of 4 persons and 1 infant up to 3 years. A baby travel bed including mattress is available free of charge in the apartment. In addition to washing machine and dryer in the apartment also an iron and ironing board are available. The beach can be reached in about 400 meters on foot. Here is a free beach chair waiting for you. Cuxhaven-Sahlenburg offers a wide range of sports and leisure activities, such as the climbing park Sahlenburg. Or how about a carriage ride to Neuwerk?